A wet chemical precipitation method is optimized for the synthesis of different sizes of CdS nanocrystals. The structural and morphological characterizations of the samples have been done using X-ray diffraction (XRD) and Transmission Electron Microscope (TEM) while compositional analysis has been carried out using Energy Dispersive Analysis of X-rays (EDAX) measurements. UV-vis spectrometric measurements were performed and the results show blue shift of the absorption edge with decrease in particle size. Further, it is also observed that the band gap increases with the decrease in particle size due to quantum size effect. 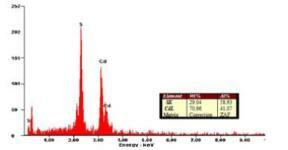 The broad photoluminescence emission peak centered at 545 nm is due to cadmium vacancies at the surface of CdS nanocrystals. This fact has also been confirmed from the EDAX analysis. The decrease in particle size induces a shift in emission maxima towards higher wavelength.